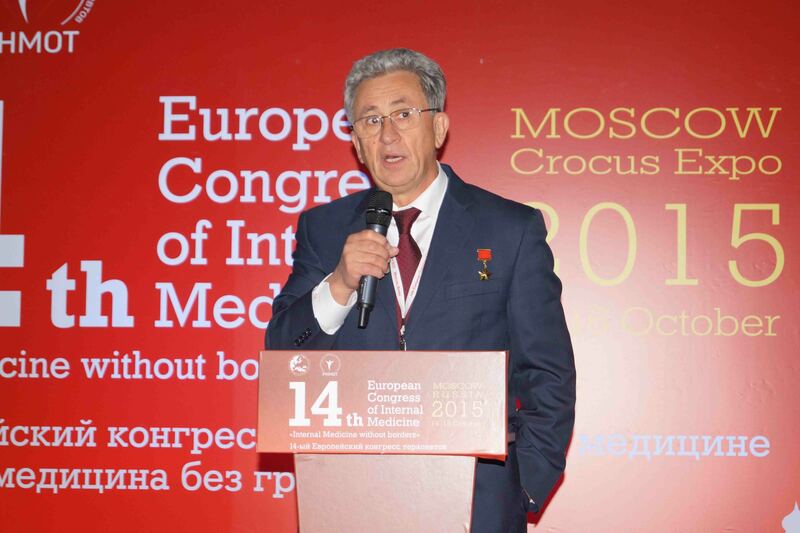 On 14- 16 October, 2015, the X National Congress of Russian Internists and the 14th European Congress of Internal Medicine (ECIM) took place at Moscow’s International Exhibition Center “Crocus Expo”. 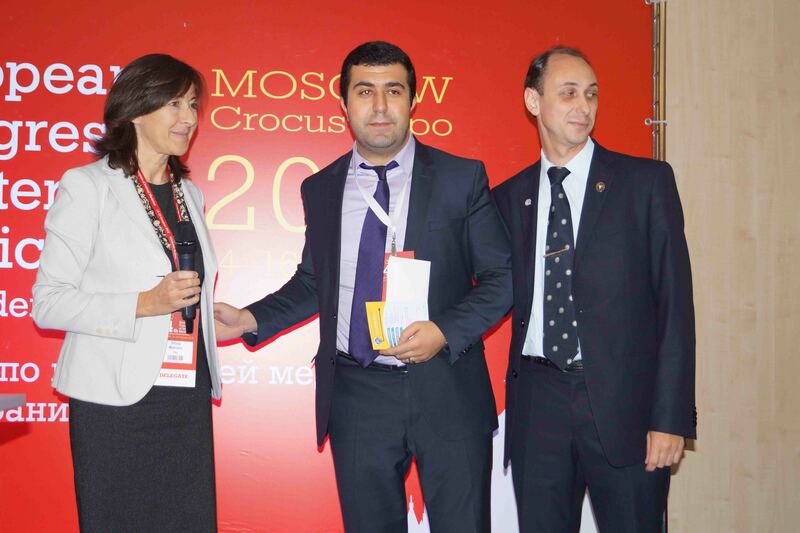 They were organized by the Russian Scientific Medical Society of Internal Medicine (RSMSIM) with the support of the Ministry of Healthcare of the Russian Federation, a general partner of the congress, a pharmaceutical firm GSK Consumer Healthcare, official event sponsors including Dr. Reddy’s, Bayer, Sanofi, Zentiva (a company in Sanofi group) and Takeda. 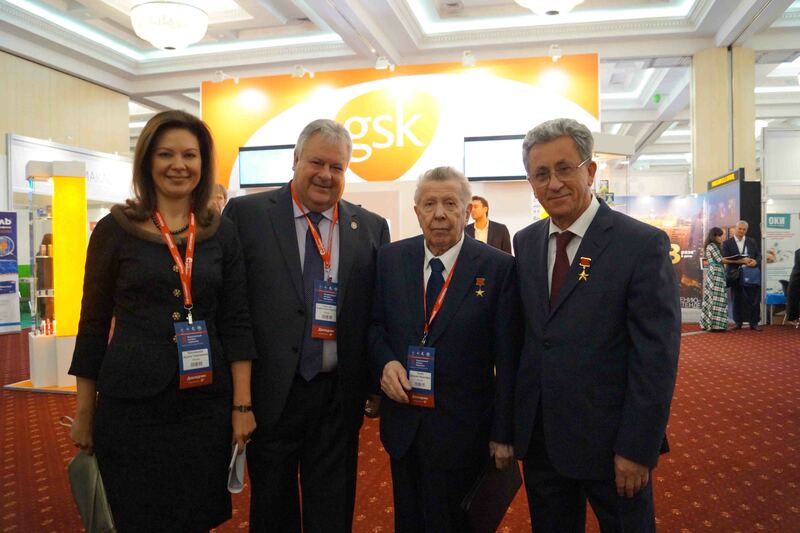 Gedeon Richter and Niarmedik were sponsors of young internists. 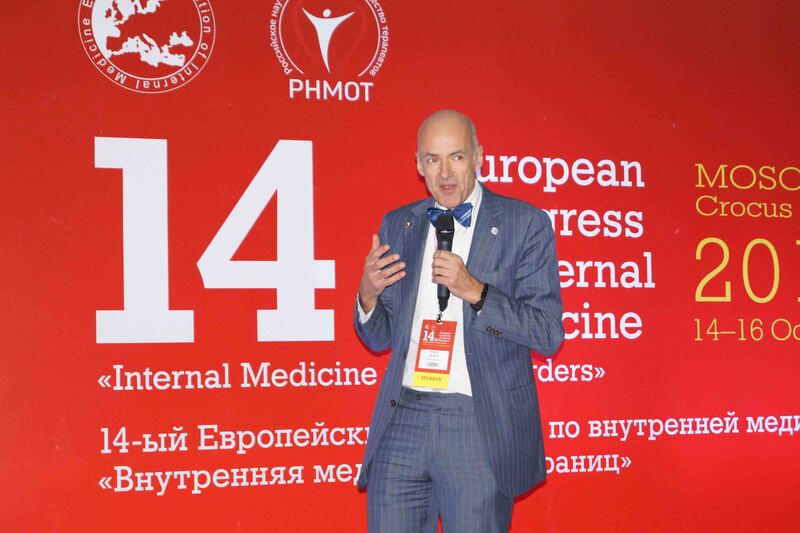 The opening ceremonies were held for the 14th European Congress of Internal Medicine (a link to the video first part second part ) and X National Congress of Russian Internists (a link to the video first part second part ). 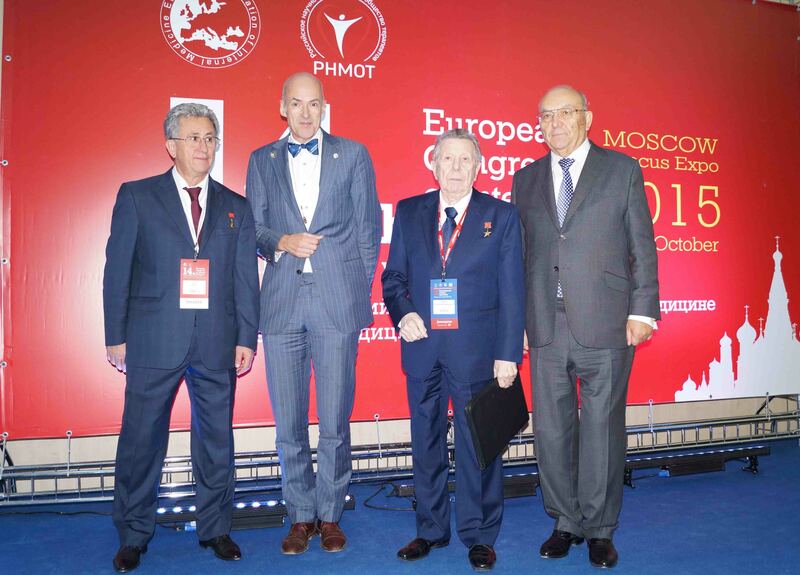 The President of the European Federation of Internal Medicine (EFIM), Frank Bosch, and President of RSMSIM, Academician of the Russian Academy of Sciences (RAS) Anatoly Martynov, addressed to all present with salutatory speeches. 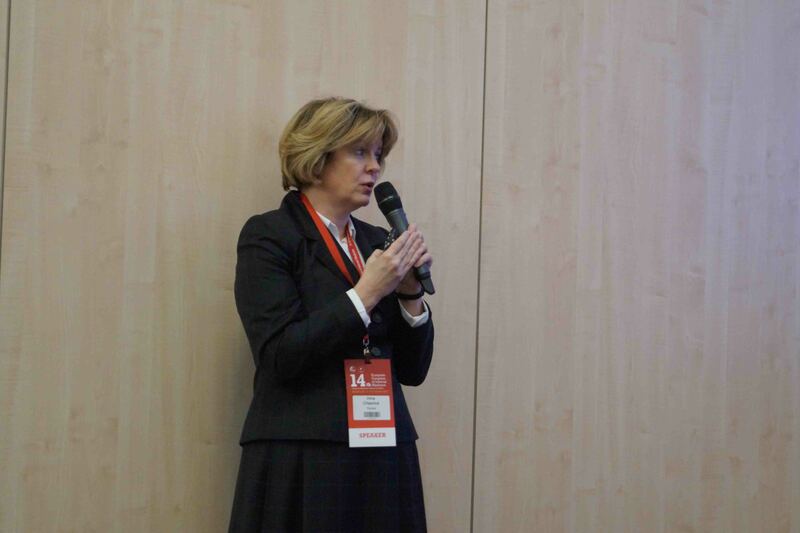 Minister of Health of the Russian Federation, Veronika Skvortsova, welcomed the participants on behalf of the Government of the Russian Federation. 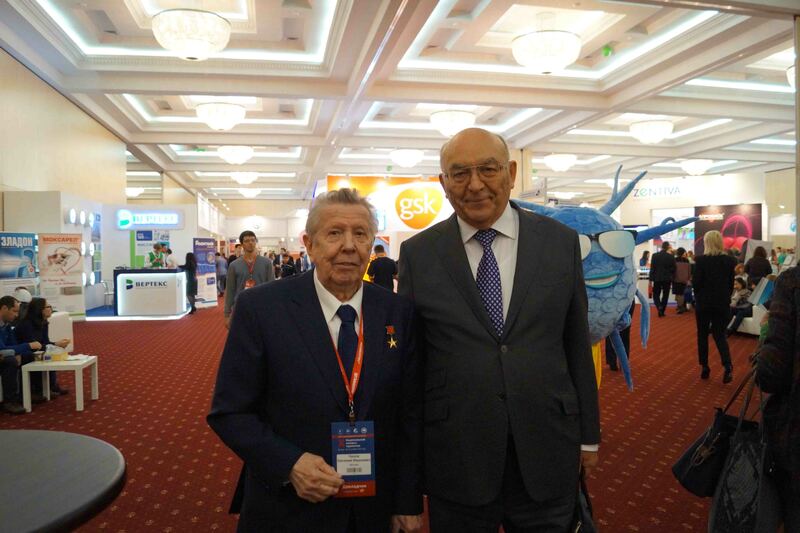 The attendees were honored to have Academician of the Russian Academy of Sciences and Nobel Laureate, Evgeny Chazov (a link to the video), and Vice-President of Russian Railways for Healthcare and pilot-cosmonaut, Oleg Atkov, who delivered their honorary lectures (a link to the video). 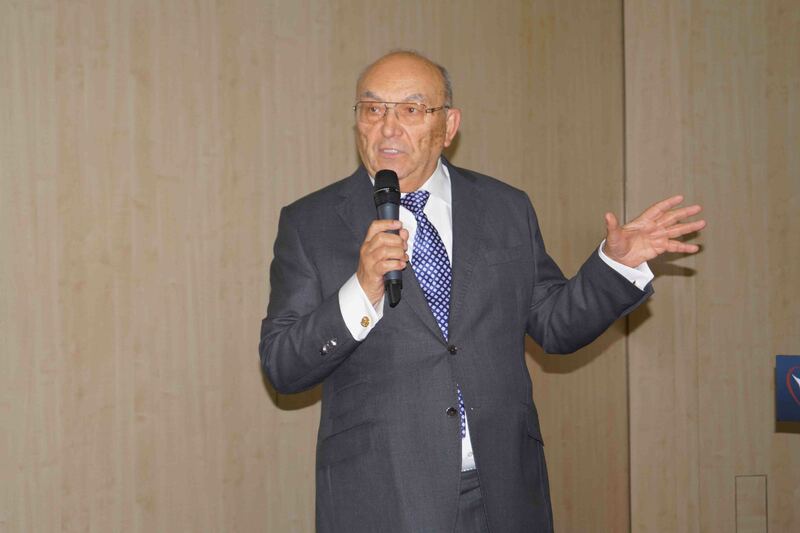 In their speeches, they outlined key achievements in Internal Medicine over the recent decade. 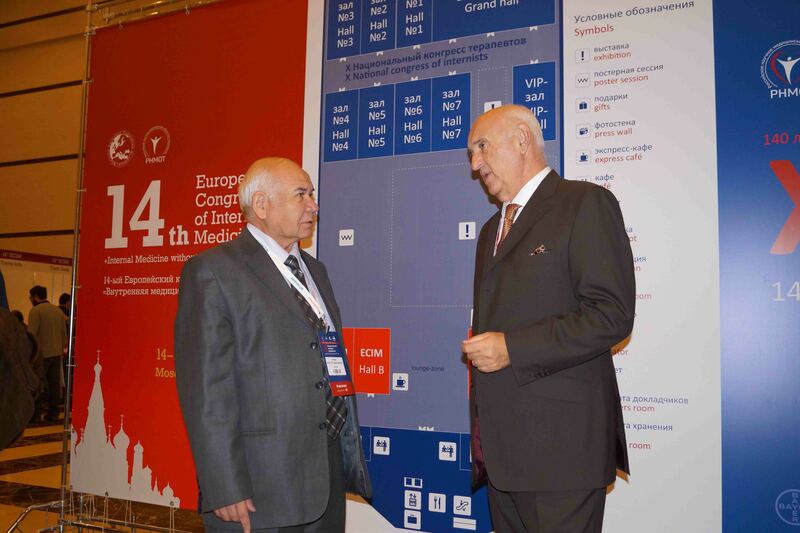 A broad variety of presentations were delivered during the 14th European Congress of Internal Medicine (ECIM): “Ultrasound and Internal Medicine” by Dr. Frank Bosch (Arnhem, the Netherlands), the President of the European Federation of Internal Medicine (EFIM) (a link to the video), “The New Guidelines on Pericardial Diseases: an Overview for the Internist” by Dr. Antonio Brucato (Bergamo, Italy) (a link to the video), “Overdiagnosis and Overtreatment – Problem of Modern Medicine” by Dr. Lubos Kotic (Prague, Czech Republic) (a link to the video), “Actual Therapy Strategies of Diabetes Treatment Type 2 Diabetes” by Dr. Petra-Maria Schumm Draeger (Munich, Germany) (a link to the video), “Genetic and Epigenetic Mechanisms in Non-ischemic Heart Failure” by Director General of the V. A. Almazov North-Western Federal Medical Research Center, the President of the Russian Society of Cardiology, RAS Academician, Evgeny Shlyakhto (Moscow, Russia) (a link to the video), “Arterial Hypertension: Yesterday, Today and Tomorrow” by Chief Freelance Cardiologist of the Ministry of Health of the Russian Federation, the President of the Russian Medical Society on Arterial Hypertension (RMSAH), the Vice President of the National Stroke Association (NSA), the Russian Society of Cardiology, Doctor of Medical Sciences, Professor Irina Chazova (Moscow, Russia) (a link to the video), and “Evaluating the Effectiveness of Long-term Treatment with Beta-blockers in the Quality of Life of Patients with Chronic Heart Failure” by Deputy Director on Scientific Research from the Republican Scientific and Practical Medical Center for Therapy and Medical Rehabilitation, Doctor of Medical Sciences, Professor Umida Kamilova (Tashkent, Uzbekistan) (a link to the video). 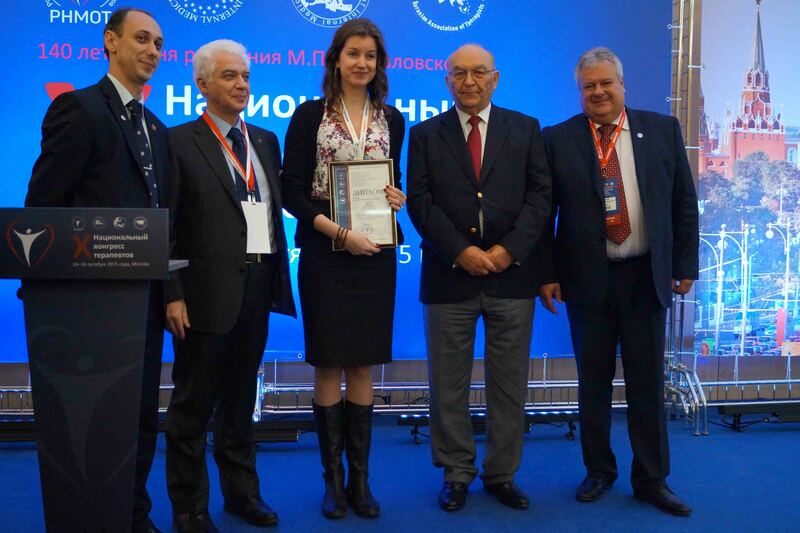 RAS Academician Anatoliy Martynov (Moscow, Russia) delivered an address at the plenary session of the National Congress of Russian Internists “10 years: Contemporary History of RSMSIM” and Sergey Boytsov (Moscow, Russia) made a presentation entitled “Epidemiology and Prevention of Noncommunicable Diseases in the Russian Federation”. Furthermore, Z.Z. 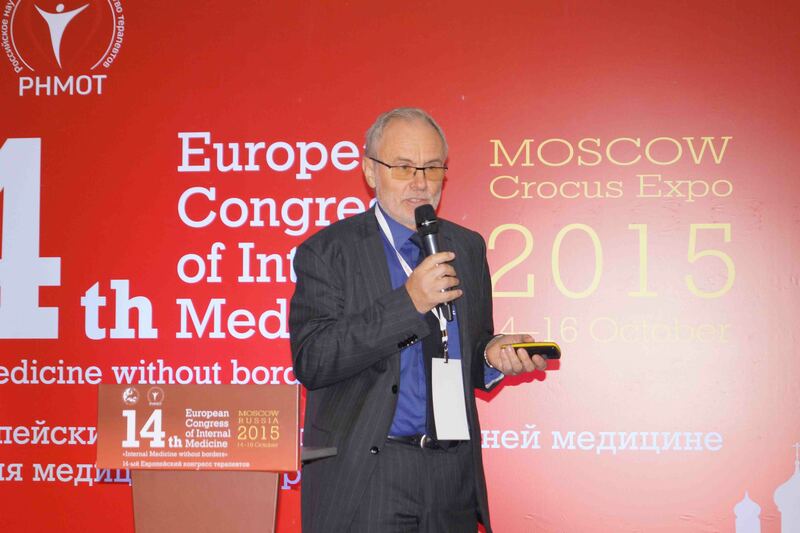 Balkizov (Moscow, Russia) presented his speech on “New Principles of Continuous Medical Education. 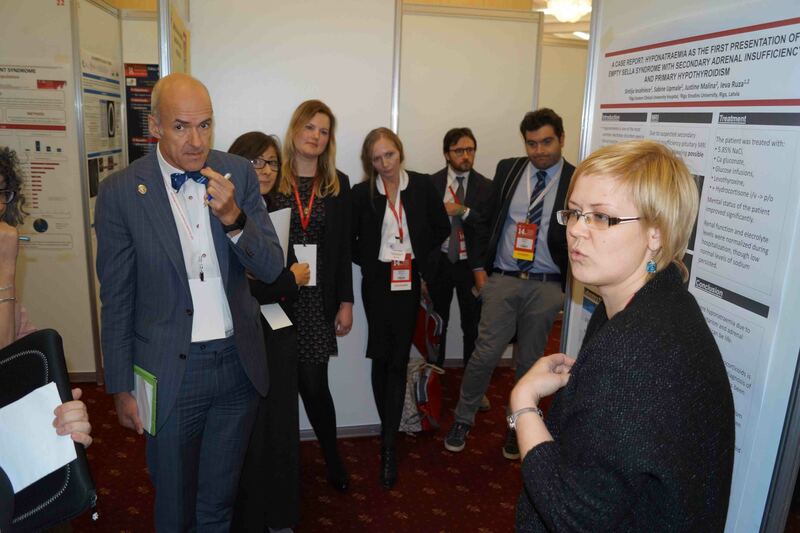 The congress also hosted a number of symposia: “Urgent Issues of Chronic Heart Failure in the Practice of an Internist. 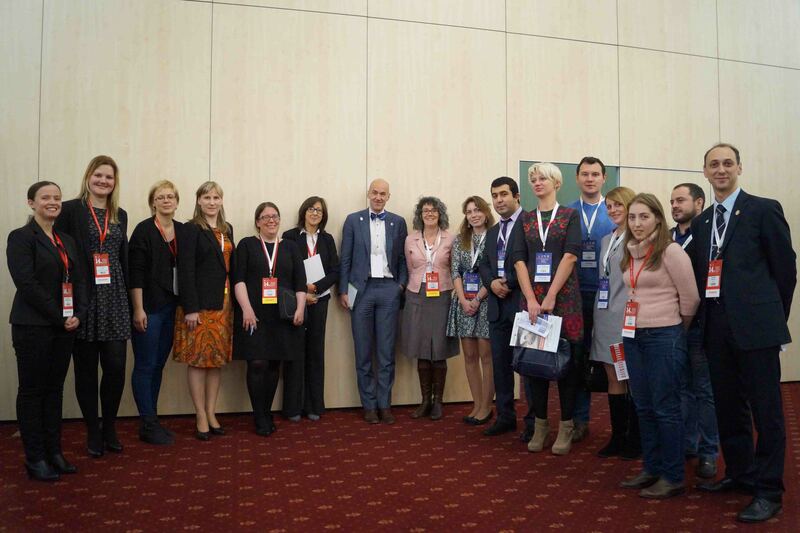 Jointly with RSMSIM, Russian Society of Heart Failure Specialists (RSHFS), Eurasian Association of Therapists (EAT), “Relevance for Practice (a symposium dedicated to the memory of V.P. 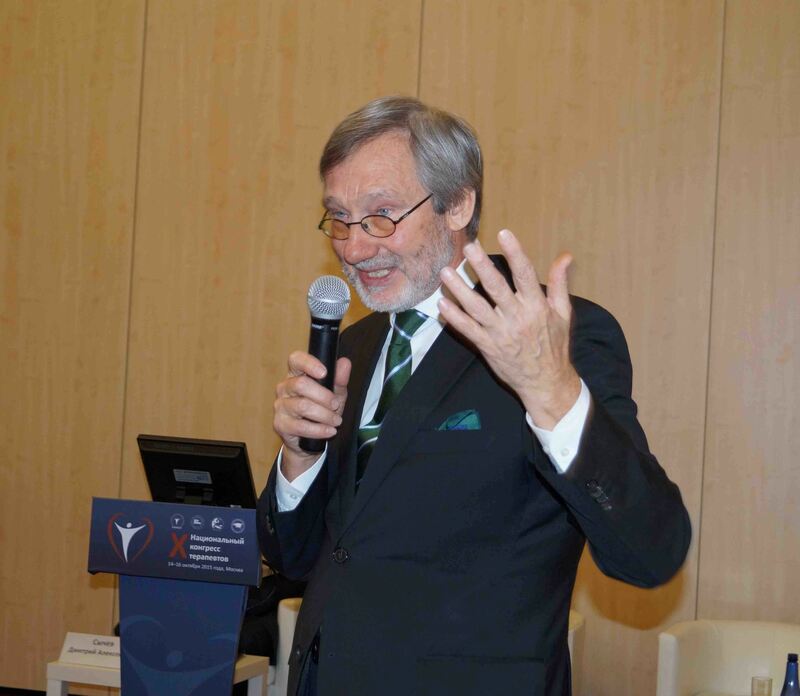 Pomerantsev)”, “Urgent Issues of Internal Medicine”, “Systemic and Pulmonary Arterial Hypertensions: Similarities and Differences”, “New Possibilities of Diagnostics and Treatment of Vascular Pathologies in the Clinical Picture of Internal Diseases”, “Nephrology Problems in the Practice of an Internist”, “Dorsopathies. 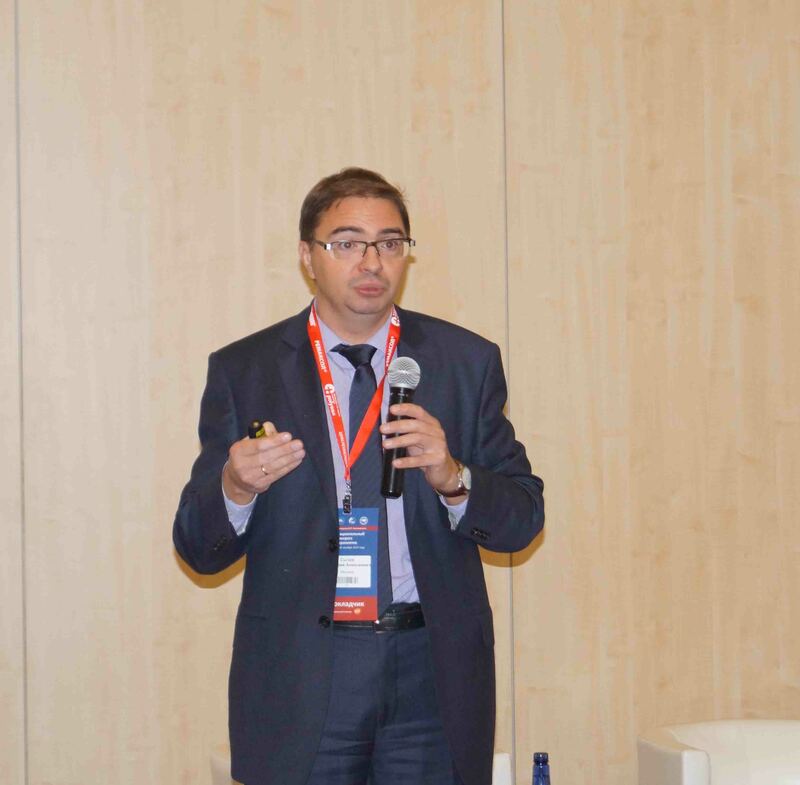 What a Primary Care Physician Should Know and Do”, “Innovations in Gastroenterology”, “Secondary Prevention of Myocardial Infarction and Acute Cerebral Circulation Disorders”, “Topical Therapy Aspects of Occupational Medicine”, “Deep Venous Thrombosis and Pulmonary Artery Thromboembolia (PATE): Complex Issues in Daily Practice. 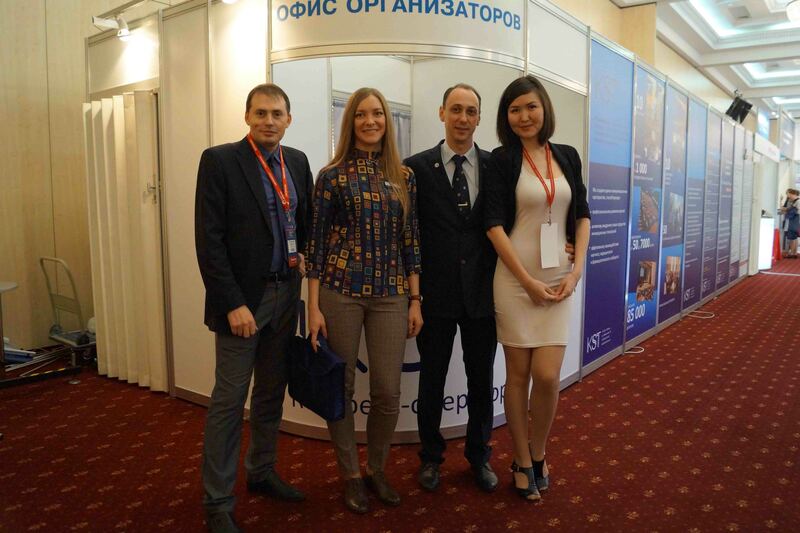 Jointly with the Russian Association of Phlebologists, jointly with EAT”, “Chronic Kidney Disease in Real Clinical Practice”, “Stable Forms of Ischemic Heart Disease in an Internist’s Practice. 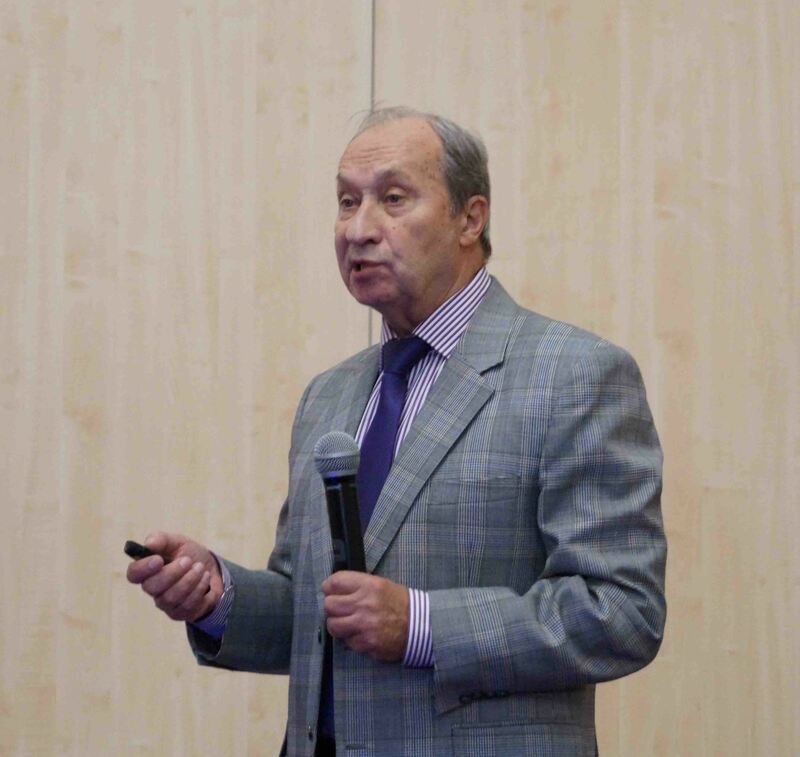 Complex Issues of Drug Therapy”, “An Elderly Patient in Practical Internal Medicine: Modern Principles of Geriatrics”, “Urgent Issues of Internal Medicine” within the frameworks of which, Anatoliy Martynov (Moscow, Russia) delivered a presentation “Diabetes and Urinary Tract Infections (UTI) – How to Help without Harm?”, “Nonalcoholic Fatty Liver Disease: Complex Issues of Treatment in Practical Internal Medicine”, “Diabetes Mellitus in Daily Practice of an Internist. 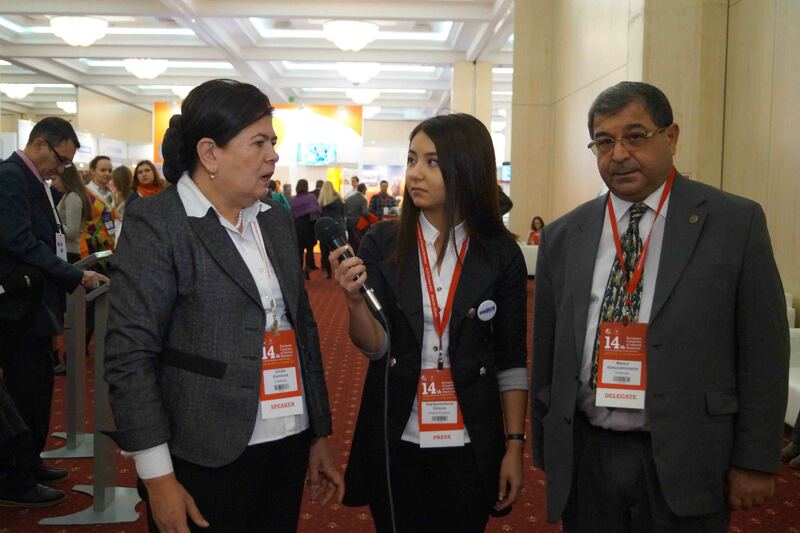 Complex and Unresolved Questions. 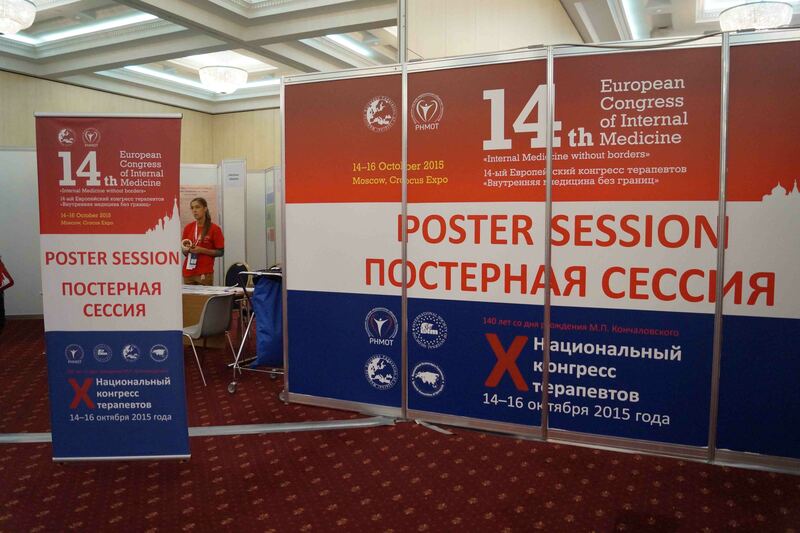 Joint Session of RSMSIM and EAT”, “Modern Medication Techniques in Rheumatology Practice”, “Comorbidity in an Internist’s Practice: Solving Complex Problems”, “Choosing Drug Doses for Patients with Chronic Liver and Kidney Diseases”. 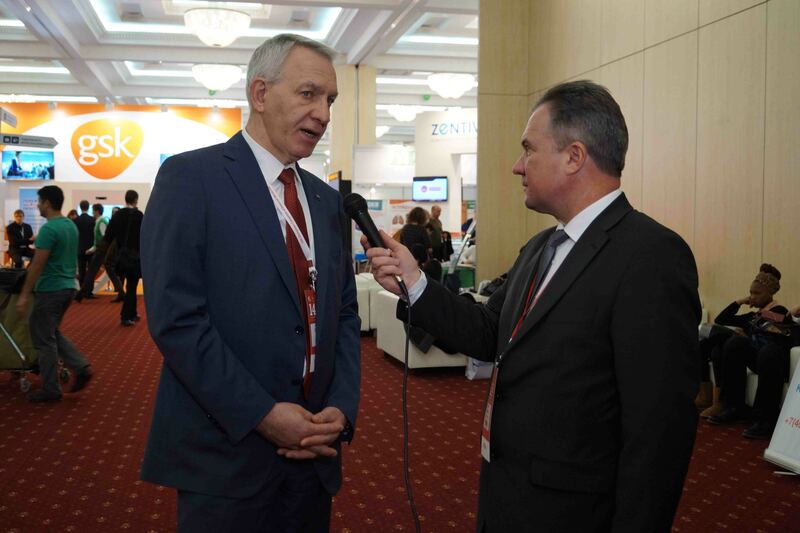 There were also satellite symposia of Boehringer Ingelheim Company “Prevention of Stroke during Atrial Fibrillation According to Real Data from Clinical Practice”, Novartis Consumer Health Company – “Modern Approaches to Treatment of Rhinitis of Various Genesis”, Takeda Company – “A High-risk Hypertension Patient: Who is this?”, “Diuretics. 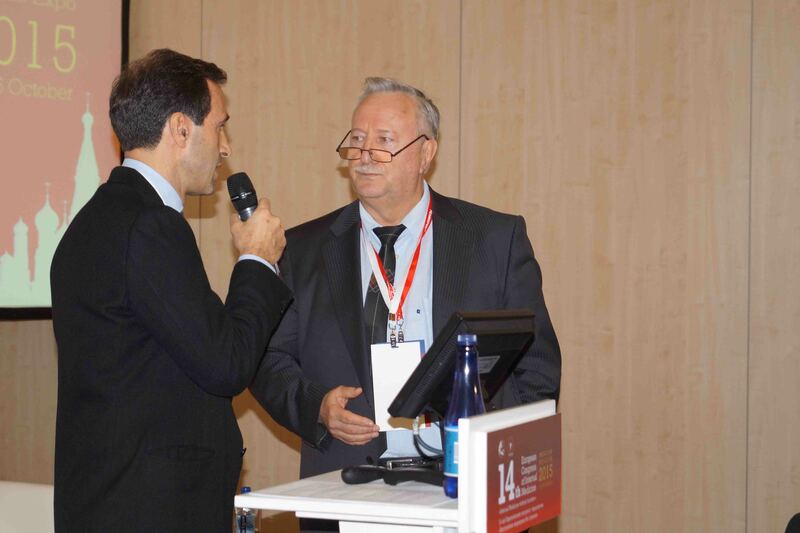 Coordinated and Non-coordinated Positions”, Egis Company – “Arterial Hypertension and Dyslipidemia: Key Areas of Treating a Patient with a High Cardiovascular Risk”, and a satellite symposium of Materia Medica Company – “Innovations in the Area of Respiratory Infections: a Path from Research to Practice”, a satellite symposium of Bayer Company – “A Consensus on Managing Patients with Osteoarthrosis and Comorbidity in General Practice”. 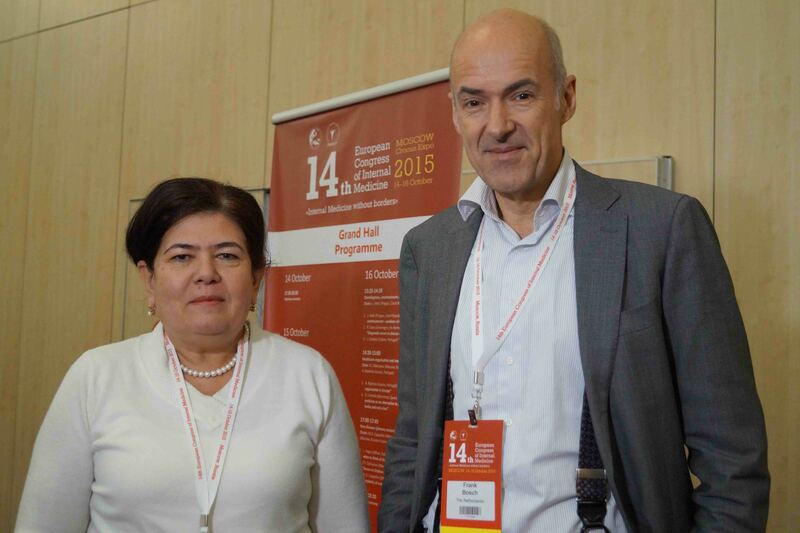 The general partner of the congress, Novartis Consumer Health, also hosted a satellite symposium “Pain Management for Articular Syndrome in Elderly Patients: Problem and Solutions”, which was a platform for the following presentations: “Comorbidity during Ostheoarthrosis. 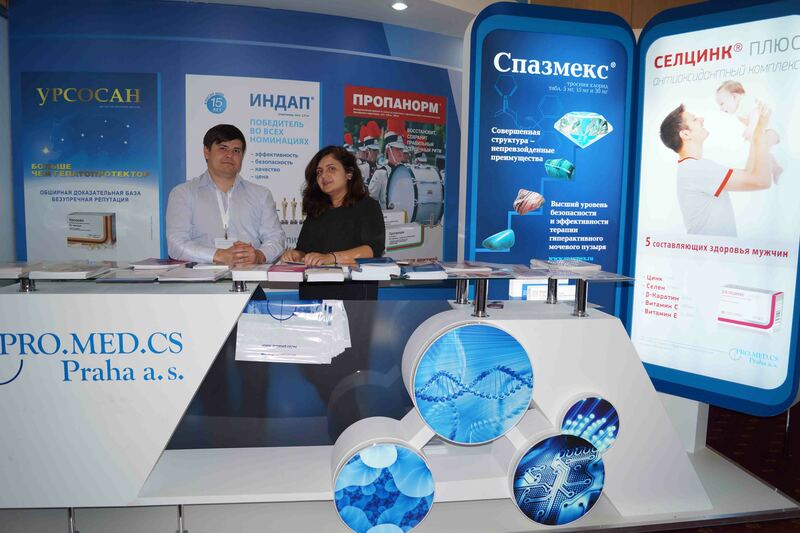 The Problem of Treatment” (a link to the video) by V. V. Badokin (Moscow, Russia) , “Ostheoarthrosis with Deposition of Calcium Pyrophosphate Crystals. 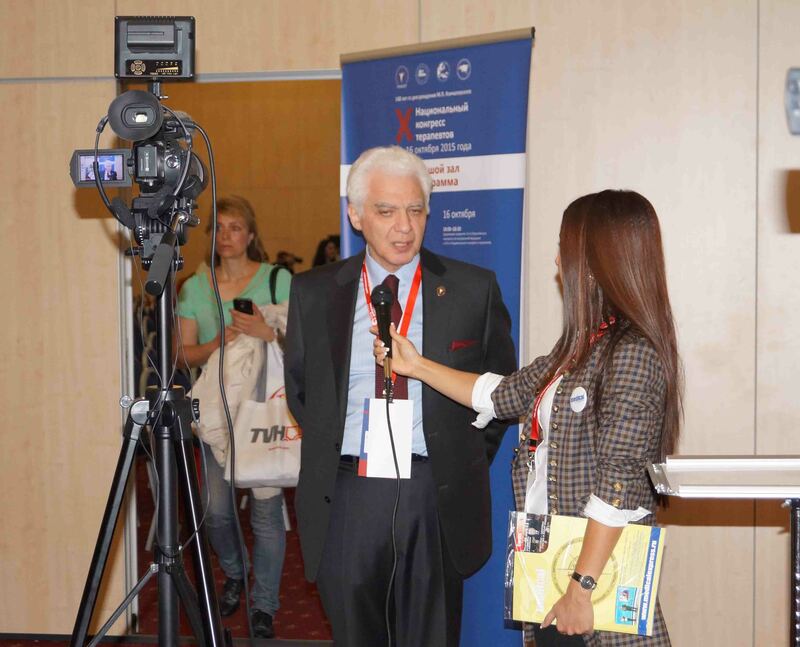 From Clinical Examples to European Recommendations on Diagnosis and Treatment” by V. V. Tsurko (Moscow, Russia) (a link to the video) , and “Specific Features of Using Non-steroid Anti-inflammatory Drugs (NSAIDs) in Elderly Patients: A View of a Clinical Pharmacologist” by D. A. Sychev (Moscow, Russia) (a link to the video) and others. 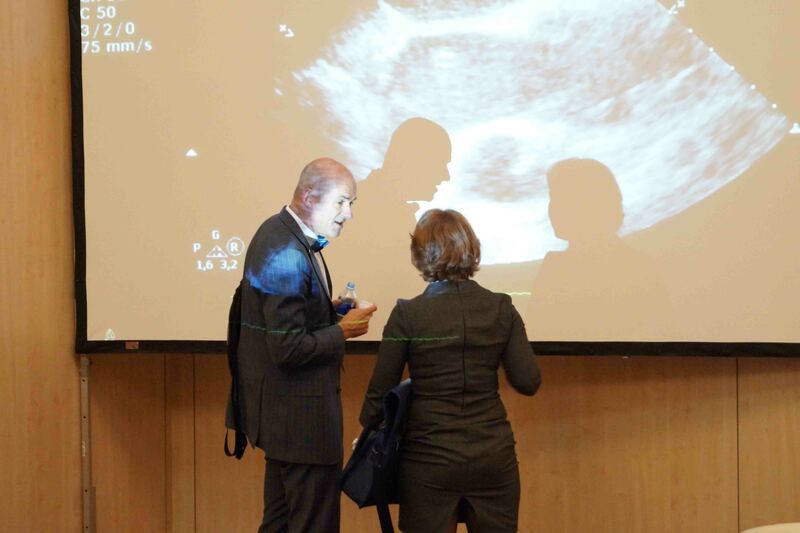 Master classes such as “Prevention of Sudden Death in an Internist’s Practice”, “A Strategy of Determining Doses of Nephrotoxic Drugs for Patients with Chronic Kidney Disease (antibiotics, NSAIDs, statins, and diuretics)”, and “Differential Diagnostics of Ascites in an Internist’s Practice” as well as others were held during the congress. 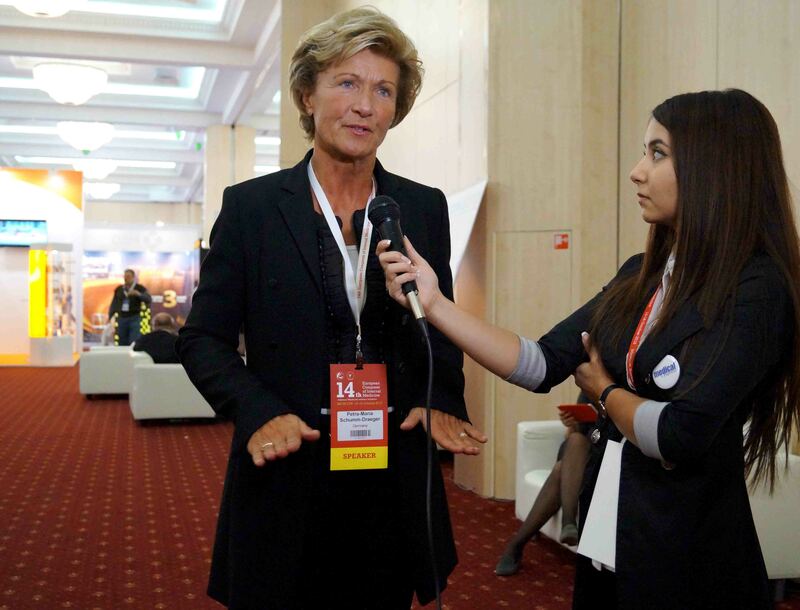 Photo and video corr. by Medical Express.